If you are questioning your use of plastic or wire coat hangers, due to the environmentally devastating affect their disposal has on landfill each year, you will be delighted to know that an alternative exists. 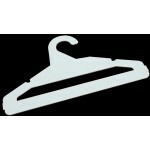 DEFENDA Green Hangers are Environmentally Friendly Cardboard Clothes Hangers / Coat Hangers. They are also a superb safer option for organisations where safety is a major concern such as: HM Prison Services, Mental Health Facilities, Care & Nursing Homes & Many other institutions where metal or plastic hangers can be used as weapons against other residents or allow for self-harming among vulnerable patients.